The former president of the Czech Republic, Vaclav Havel, is an enigmatic individual. One has to use the qualification enigmatic, because his public pronouncements and past deeds are bewildering and because after all, Mr. Havel seems a decent man and it would not be decent to heap invective on him. His most recent exploits concern a series of statements made to the press and published in the Italian newspaper Corriere della Sera (22 november 2008). What did Mr. Havel say? First of all, that “the West” should not fall in the trap of appeasing Russia and that he hoped Italy's prime minister Berlusconi would have the ability to speak in clear terms to his Russian friend and colleague Putin during their scheduled meeting to discuss East-West relations. Mr. Havel called the Russian plan to station nuclear missiles in the Kaliningad enclave “outrageous”. Secondly, that he was strongly supportive of the admission into NATO of the Ukraine, Georgia and even Byelorussia (but only after Mr. Lukashenko shall have left the stage). Thirdly, that in Russia, human rights and democracy were systematically violated, as opposed to “the West”. Like so many others these days, Mr. Havel seems to believe that the member states of the European Union and NATO are democracies, where freedom and human rights are well protected. This is an absolute fallacy. 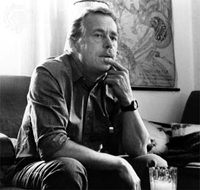 On the basis of this fallacy Mr. Havel, whose country has only recently joined both NATO and the EU, contemplates the world around him and inevitably comes to the self-congratulating conclusion that human rights and democracy scarcely exist outside “the West”. Precisely all over the West, however, human rights have been dismantled systematically in the interest of state security. Government spy agencies listen in on telephone conversations, read e-mails and keep track of what internet sites are being visited and by whom. Carrying an ID-card has become mandatory or on the verge of becoming so, just as in the days when Hitler's armies were occupying most of Europe. Just like the Gestapo, the SS and the Grüne Polizei once did, European policemen and customs officials today can willfully stop any person on the street and request to see his papers. In Western Europe, until mid-seventies, only the police in Spain and Portugal had such wide ranging powers and this was precisely the reason why these countries were shunned by freedom-loving European travelers. On a more general level, today there is not one single member state of the EU or NATO that can be called a democracy. Governments do as they please, supported by a supine press and spineless media. Moreover, in the EU, 80% of legislation is imposed by the European Commission at Brussels, an entity that can best be compared to the Politbureau of the former Soviet Union. There is no measure of parliamentary control on the commission whatsoever. The European Parliament at Strasbourg is devoid of any real power and cannot depose the commission. Many of its members are corrupt, third-rate, and sidelined politicians who do little more than pocketing their lavish allowances. National governments and parliaments today can only make decisions concerning the remaining 20% of legislation, which often amounts to little more than having a say as to where a new stretch of highway is to be built. For all practical purposes the monetary policy of EU member states is decided by the European Central Bank at Frankfurt, economic policy by the European Commission, and foreign and defence policy by NATO, which boils down to Washington DC. The average European of voting age, therefore, has no influence whatsoever on how his country is governed nor can he influence the policies that determine his everyday life. Some democracy !! Nobody in “the West” today is in the position to lecture any other country on democracy and human rights. Human rights are being trampled on a massive scale all over “the West”, just ask gypsies in Spain, Rumanians in Italy, asylum-seekers in the Netherlands, Blacks in the US (despite Obama's election), Palestians in Israel and so on and so forth. Mr. Havel's suggestion that the Russian decision to place missiles in the Kaliningrad enclave is an outrage is in itself outrageous. Not to see that it is a response to the placement of US missiles in Poland and the installation of a radar warning station in the Czech Republic is the height of naiveté. What does the US need a missile defense in Europe for ? Certainly not for defending Europe. Perhaps because the US still considers Europe to be its colony, since Europe is not under threat from anybody and frankly has not been since 1945. Politics being the strict quid pro quo business it is and always has been, altruism does not have a place in it and never had. One who believes otherwise is either stupid or silly. And since one cannot accuse Mr. Havel of being either stupid or silly, there must be another explanation. It is a scandal Mr. Havel supports NATO partnership for Georgia. Only a few weeks before he made this pronouncement, the BBC, never to be suspected of a lack of loyalty to “Western” values, announced the tragic Caucasus War of last August was started by Georgia's president. This irresponsible little sorcerer's apprentice, this juvenile delinquent, should not be rewarded for starting a bloody war and causing the deaths of hundreds of innocent civilians and untold midery to thousands of others. By admitting Georgia, NATO would only further compromise its already sorry reputation in the fields of human rigts and democratic values. Moreover, Georgia's security could never be ensured by NATO membership. Georgia's security rather depends on its having good relations with its neighbors, Russia in the first place. Anyone who supports Georgia's entry into NATO is either has bad intentions or is deluded. What explains Mr. Havel's declarations to the Italian press ? It seems Mr. Havel lives in a world that no longer exists, a world that exists only in his imagination. Unfortunately, the opinions expressed by Mr. Havel are shared by millions and millions in “the West.” Such opinions are to be found all over the media, repeated daily ad nauseam, and have been part and parcel of public opinion in Western Europe and the United States for decades now. In essence, these ideas are a leftover from the days of the Cold War. Rather, it is just Cold War ideology dressed up a bit. Like so many in Europe and the US today, Mr. Havel seems to suffer from a bad case of Russophobia, the unreasonable fear and hatred of Russia and everything Russian. This psychological disorder is not uncommon in the Czech Repubic and other countries of Eastern Europe. Russophobia would at least explain many, if not all of Mr. Havel's public utterances. It has also occurred to me there might be another explanation: could it be that Mr. Havel believes Bohemia (as the Czech Republic used to be known before 1918) is still part of the Habsburg Empire? After all, if ever a state has been subject to self-delusion, it was the Habsburg Empire during the final years of its existence. Threatened with dissolution during the Revolution of 1848, the multi-ethnic Habsburg Empire was saved in 1849 by Russian troops moving in to reestablish order in. Yet the Habsburgs never showed any gratitude toward Russia and went on to betray their saviour a few years later. They did not lift a finger in 1854 when Russia was attacked simultaneously by France, Britain and Turkey. Action by the Habsburgs could have made a world of difference and avoid the bloody Crimean War that resulted from the landing of French and British troops on Russian territory. In fact, Russophobia and treachery became the hallmark of Habsburg foreign policy. Before 1914, Austria-Hungary and Russia shared the distinction of being the most politically and socially conservative states of Europe, where human rights were practically non-existent and democracy at best an insult. The ruling dynasties, (the Habsburgs and the Romanovs) were convinced they had been chosen by God to save the world from modernism and its evils. It is well-known fact that traditional ways of thinking can be very resilient and difficult to eradicate. Perhaps only a violent and revolution or a long, repressive political regime. The successor states of the Habsburg Empire not having experienced an upheaval quite as profound as the Russian Revolution of 1917 or the ensuing Soviet system (lasting more than seventy years), one is led to assume that ancient Habsburg ideas have somehow resurfaced and taken new forms. So that must be it, that explains it ! Mr. Havel is a subject of the Habsburg empire come back to life, a leftover from an ideology long believed to be dead and buried ! I just never realized the Habsburg legacy would still be so strong today. Poor Mr. Havel.